Christmas traditions vary across regions in Europe. Not entirely surprisingly, the residents of Central Europe tend to go a bit to the dark side with their tales. While Saint Nicholas rewards good kids, he has a companion called the Krampus, a half-demon / half-goat who punishes Santa’s rejects all the way from Bavaria down through northern Italy and former Yugoslavia. 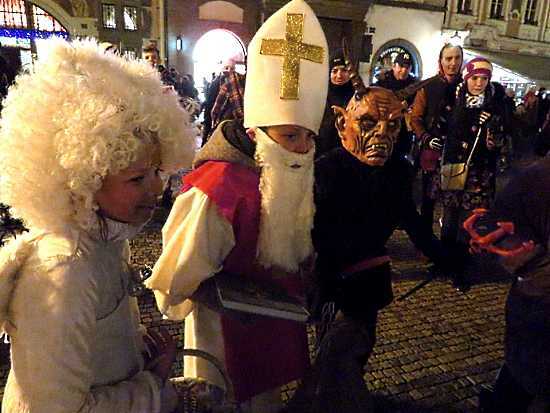 In the Czech Republic, on the evening of December 5, people dress up as Svatý Mikuláš (Saint Nicholas), Anděl (Angel) and Čert (Devil). They then go to town squares to mingle with small children and possibly hand out candy. 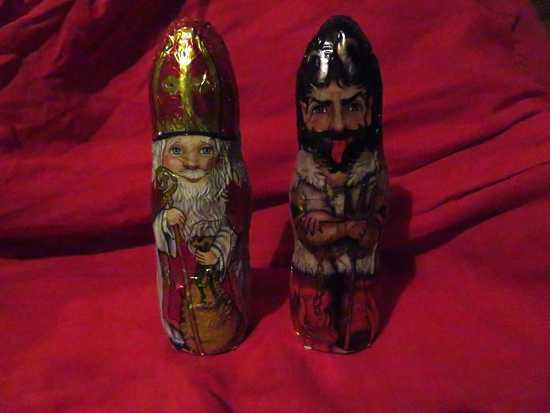 December 6 is the Catholic feast day for St Nicholas / Mikuláš, so December 5 is Sv Mikuláš Eve. In Austria and parts of Germany, December 5 is called Krampusnacht, emphasizing the demonic companion. The demon traveling with Mikuláš in Bohemia is commonly called Čertík Bertík, or Little Devil Bert. He has curly black hair, a darkened face from coal dust, a black furry coat and a chain. Mikuláš judges the kids, and either the Angel gives out candy or Čertík Bertík rattles his chains and threatens to hit the kid. 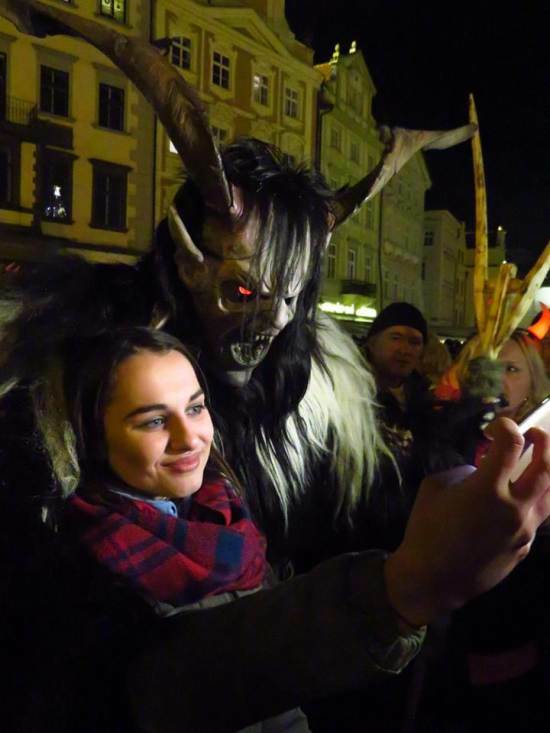 In recent years though, the more traditional concept of the Krampus has had a big revival, and single demons in elaborate furry costumes with full goat-like face masks, cloven hooves and horns have been taking over Mikuláš Eve. 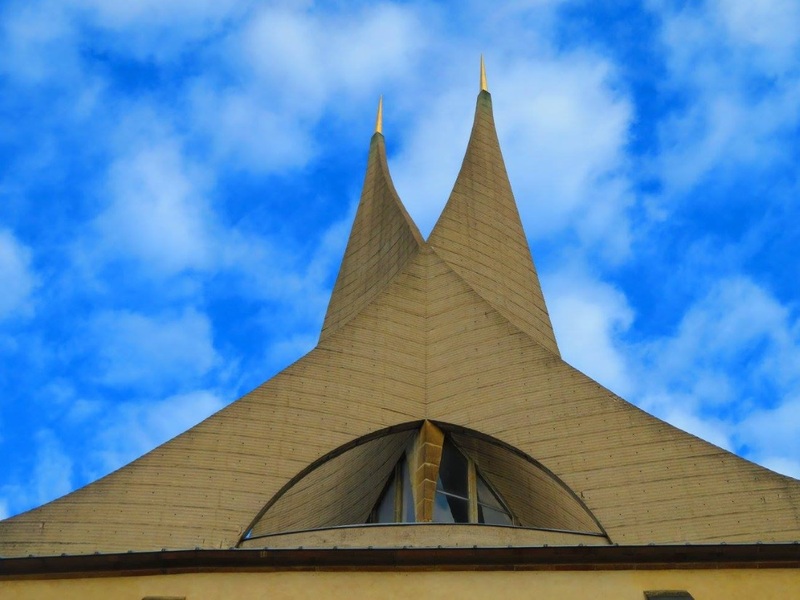 Sv Mikuláš and the Angel, conversely, are becoming harder and harder to find. 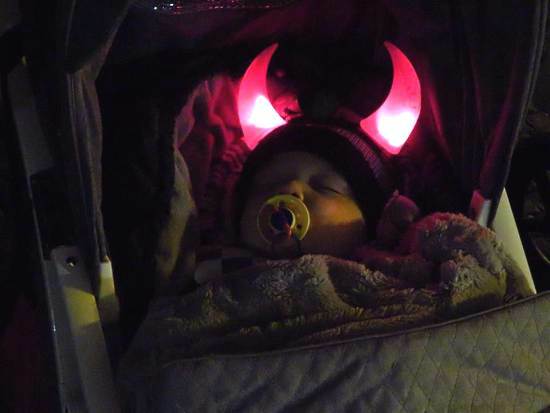 Street vendors in larger towns and cities sell light-up devil’s horns for kids to wear, so everyone can join in. Angel halos and Santa hats are virtually nonexistent in vendors’ stalls. The classic Krampus carries birch branches and wears a cowbell. He takes his job rather seriously, and isn’t one to just hand out lumps of coal or make idle gestures. He puts bad children in a burlap sack, beats them into submission with his birch sticks and takes them with him back home for the rest of eternity. 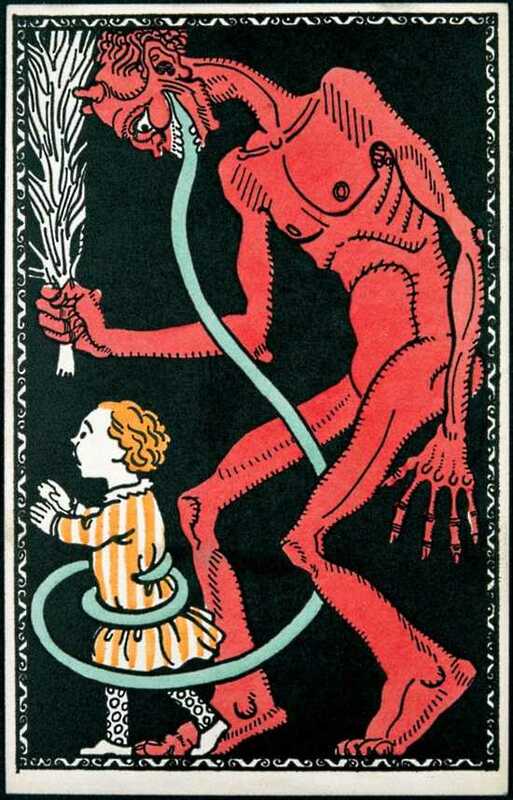 Children can appease the Krampus with a little song and dance. But many smaller ones simply burst into tears, so it is into the sack and off to Krampusland they go. Well, at least in theory. With the modern trend of giving everyone participation trophies just for showing up and an A+ for simply writing their name correctly on the final exam, most parents let the little ones off the hook and give them a candy anyway. Speaking of candy, most people are familiar with chocolate statues of Santa, the counterpart to chocolate Easter bunnies. In countries with a Krampus tradition, you can also get chocolate demons and gingerbread demons. 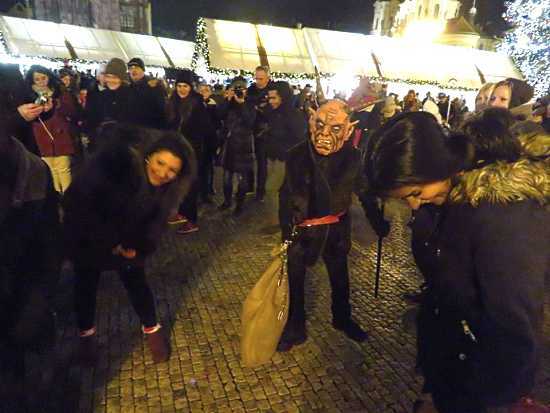 Outside of Prague, some small towns make large celebrations of Krampus. 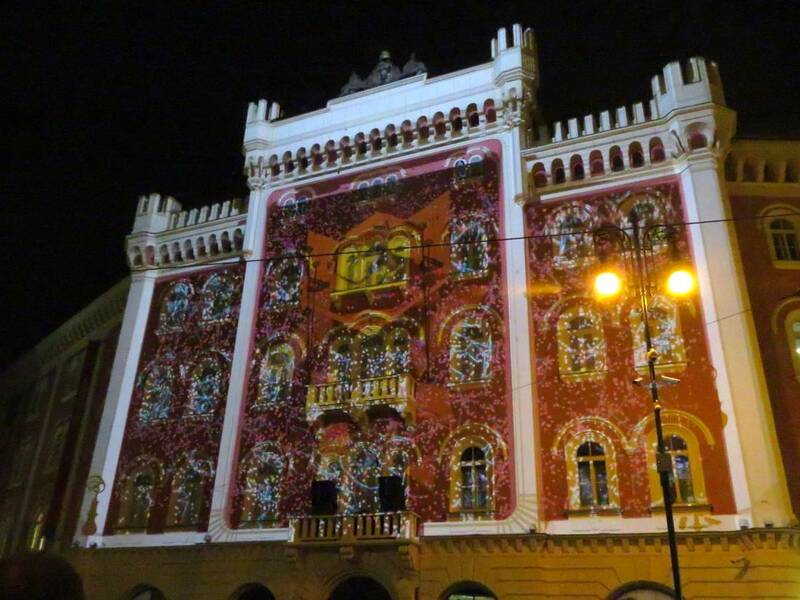 Kaplice, a South Bohemian town near the Austrian border, has an annual celebration billed as the world’s largest. 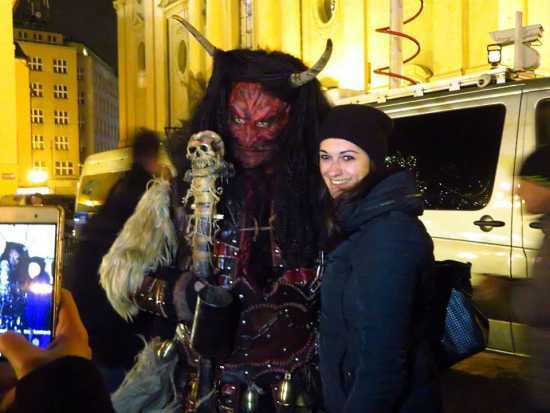 It attracts hundreds of cosplaying Krampuses and thousands of spectators. The town’s population is only 7,000 and the number of spectators that come is larger than the town’s population. They revived the tradition of having a Krampus parade in 2012, and it has been growing every year. 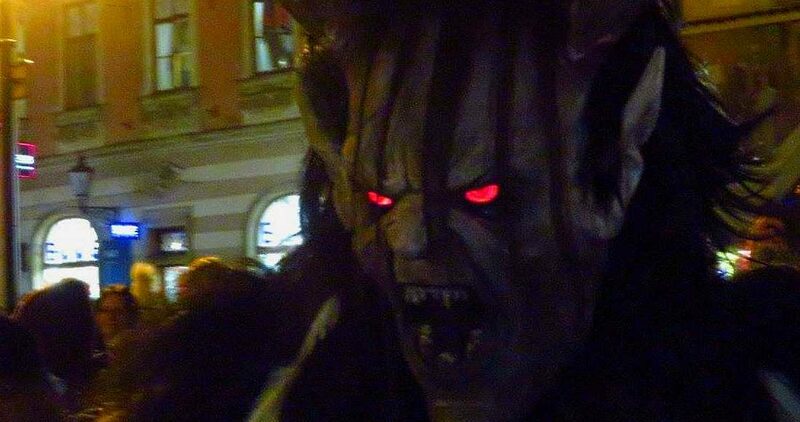 The town also now maintains a year-round gallery of Krampus masks and costumes in the cellar of the former Rožmberk brewery and has registered Krampus as a brand name in the Czech Republic. The town wants the term to be used only for their specific celebration. The village’s management hopes the place will become the focal point for Krampus activity and for the gallery to put the town on the tourist map. The Kaplice event is a recent revival, though. Folk customs have a much stronger hold in Moravia, the eastern part of the Czech Republic. 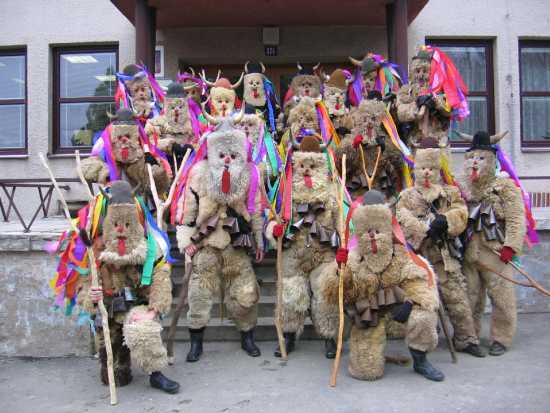 The villages of Francova Lhota and Valašské Klobouky in the Zlín region of southeastern Moravia have long maintained a Krampus tradition, thought its costumes are much less scary than those of Kaplice. These ones have tan-colored furry masks and matching full body suits, with whimsical touches such as colored ribbons. Celebrations can last three days. These Krampus costumes look more like traditional folk craftwork than the rather modern heavy metal–inspired ones seen in Kaplice. Bohemia used to be a mixed multilingual Slavic and German region until World War II. Krampus parades were called Krampuslauf and greeting cards with the character were called Krampuskarten. Origins of the Krampus are up for debate, though the tale seems to have come from the Alpine region of Austria and spread from there across the former Austro-Hungarian Empire. 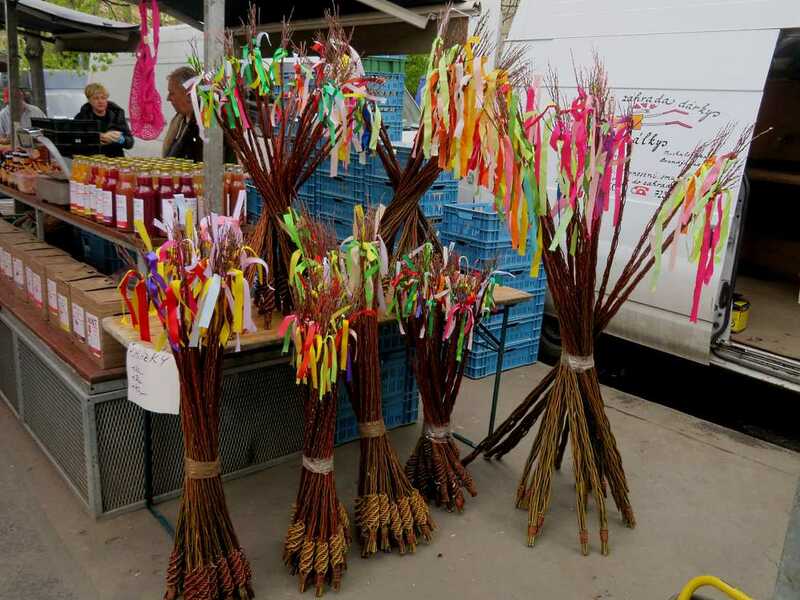 As with many European holiday traditions, the roots are likely in pre-Christian beliefs. Krampus has been linked to goat-like fertility gods and mystical initiation rituals by some scholars. The chains seen on figures like Krampus and Čertík Bertík are speculated to be a post-Christian addition to demonize the figure. The first written mention of something like a Krampus parade in Bohemia comes from the 14th century, with religious reformer Jan Hus commenting on fur-masked figures riding backwards on donkeys, together with a Sv Mikuláš figure in a bishop’s outfit. The name Krampus comes from krampen, the German word for claw. The traditional figure, before Christian times, would show up to unleash the forces of winter on the land. He is thought by some scholars to be the son of Hel, the Norse god of the underworld. Krampus is related to a similar figure of a Germanic female winter witch called Perchta or Berchta, which is turned into a male character in some areas. 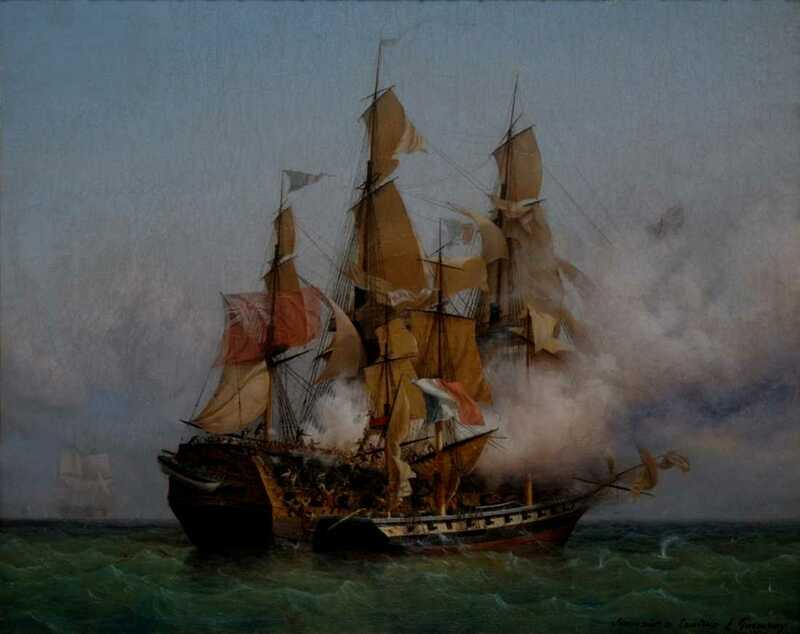 This could explain the Czech variation of Bertík as the name for the demon tagging along with Sv Mikuláš. Celebrating the Krampus was actually made illegal in Austria in the 1930s, and even in the 1950s it faced a negative propaganda campaign. The revival of Krampus can be seen as part of a larger movement to revive pagan traditions and customs across Europe and North America. Curious readers may wonder what happens on Christmas if Santa comes on December 5. When Christmas Eve rolls around, the big gifts in Bohemia are given out by Ježíšek, or Baby Jesus. Father Christmas is left out in the cold in most of Central Europe, not figuring into the scheme at all, but Grandfather Frost or the Christmas Old Man appears in Russia and the Balkans to give gifts. The Russian Orthodox Church still follows the old calendar, so gifts are exchanged on January 7. Like all others, Czech culture is overrun with images of the American version of Santa coming on Christmas. Czechs though are determined to hold onto their traditional cast of characters.